I was extremely fortunate to grow up and go to school in Edinburgh, which, as luck would have it, turned out to be virtually a crucible for the nurture of a young cellist. I first knew of Joan from my wonderful first teacher, Kitty Gregorson, both of them ex pupils of Ruth Waddell. The Waddell sisters were a remarkable, ( if somewhat daunting!) 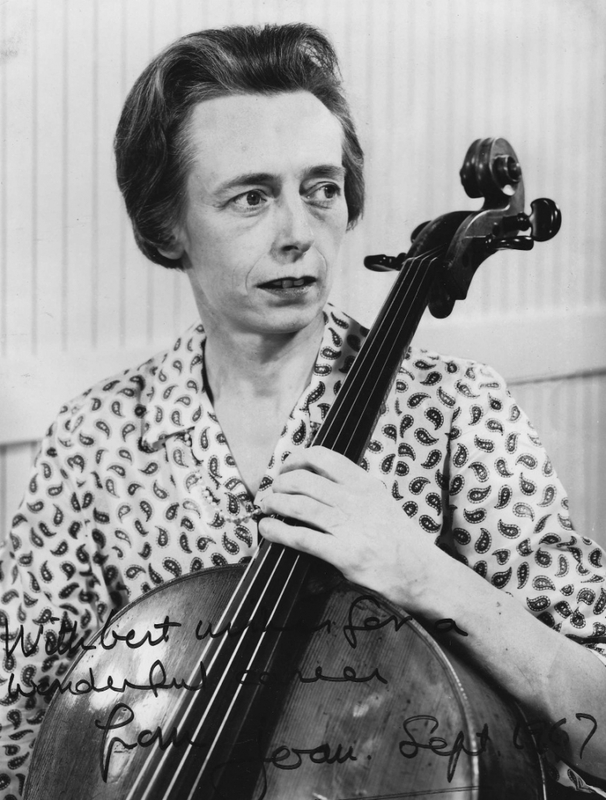 Edinburgh sorority who devoted their lives to teaching, having themselves had the advantage of a more Catholic musical education than was available in Scotland - in the case of Ruth, under Guilhermina Suggia, the colourful Portugese cellist who was for a time consort to Casals. While Scottish patriots often bemoan the isolationist fate of their country, it is interesting that in the arts and sciences there has long been a cross-fertilisation of influence to and from foreign parts. The list of Scots who made their names abroad is also long, and the names of such luminaries as Alexander Fleming, Alexander Graham Bell, Andrew Carnegie, and Robert Louis Stevenson, give some idea of the range of activities of Scots abroad. So it was in painting and music. The group of painters known as The Glasgow Boys had, in the last years of the nineteenth century regularly visited the continent and worked alonside some of the most distinguished French artists of the time. So, notwithstanding the tough and fiercely independant “Scottishness” of her background, for the young Joan, Edinburgh lived up to its cosmopolitan epithet “ The Athens of the North “, culturally as well as architecturally. Both Kitty Gregorson and then later Joan had, in turn, furthered their own studies further afield before returning to Scotland, So it was a natural progression for me to continue studying with Joan, having been, as it were, primed and undercoated by Kitty,( who must have started literally hundreds of children on the cello ) in preparation for working with Joan. It’s only now that, looking back on my years of study in the mid-sixties, during my later teens, I realise how incredibly lucky I was to have come into contact with Joan at a very important time in my life. It isn't exaggerating to say that my lessons with Joan were the central focus of my very existence, at that time. It was as though in those lessons I felt that Joan had a key to opening up entirely new dimensions in music. And not only in music. On her mantelpiece there always seemed to be invitations to private viewings for exhibitions ( a world completely unknown to me ), and I remember her talking animatedly about the particular colours of a well known Scottish artist. And she was always working on yet another new work that had been written specially for her. Coming into contact with her life was like opening a door into a new world. 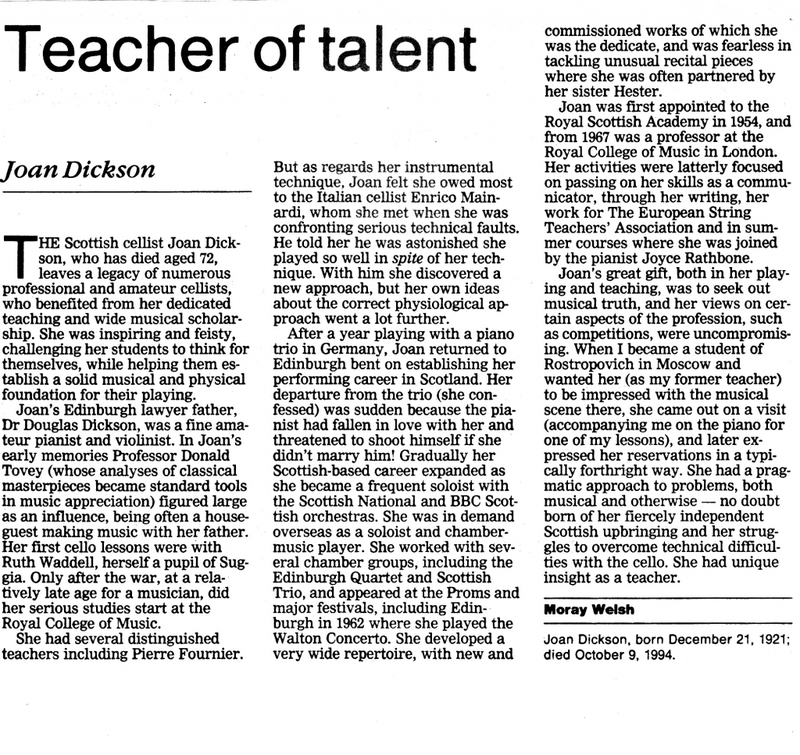 I used to follow her own playing career avidly, and remember many wonderful concerts with The Scottish Trio, with Hester Dickson, her sister, with Peter Pears, and of course in concertos with The Scottish National Orchestra, The BBC Scottish, and so on. Joan had turned her talents to so many different facets of her profession, that hearing her in concerts gave me an idea of what a cellist’s life could be like; it seemed so full of excitement and variety, and, by her own example, kindled in me some ambition to follow her. Her distinguished career had been influenced by her cosmopoltan background - she was also an accomplished pianist, and she was not afraid to tackle a wide ranging repertoire of cello music, as well as chamber music. Teaching was yet another aspect of her life to which she was, as we all know, dedicated. Of course studying with her was challenging, because it opened up higher goals, and new ways in which to search for meaning in music, rather than relying on whim, without having a reasoned argument for doing something. The commitment in her way of working was also challenging. I vividly remember a time when we had been working on the Dvorak Concerto , but I felt able, ( with a youthful confidence that knew no opposition ! ), to prepare the Walton Concerto at the same time for a master-class with Tortelier. Joan responded to this by saying that none of her pupils studied two concertos at once, and she wouldn't agree to working on both at the same time! I was confused and very upset by this, but of course after having some experience of teaching myself, understand very well now why Joan adopted what at the time I thought a very perverse attitude. Joan’s way of really getting under the skin of a piece of music was another lesson which hasn't left me. But, I’m happy to say that, in spite of this ( and some other differences of opinion ! ), I always felt that Joan was not only my mentor but also someone to whom I could go back at any time as a friend, and she would give support or advice. She herself reminded me more recently of the fact that, after she acquired the cottage at Garvald, which was quite near my home, apparently I had encouraged her to redecorate, and rather rashly offered my services. Being held to my word ( ! ), I remember some hot summer days, when I might have been otherwise amusing myself, which we spent together splashing paint on walls. I also remember how amazing it was going for walks with her, as she gave a name to practically every wild flower. She was also someone with whom one could discuss a wide variety of subjects, and whose help, at a time of teenage existential angst, was invaluable. She encouraged me to go to a summer master class in Lucerne with her teacher Enrico Mainardi, which was a further widening of my horizons, and gave me a first taste of independant foreign travel, and I remember going to a restaurant with Mainardi and Joan, where, though feeling quite out of my depth and tongue-tied, I was incredibly privileged to be included. We had a private joke between us, which was that she used to say that she had never really “ got to grips “ with me on technique because, so she said, I came to lessons and told her what I was going to do. Needless to say I don’t remember that, and though she never told me as much, I can imagine that she might have been upset that I chose to go to university in York rather than to the RCM which curtailed regular lessons with her. But I did continue to have lessons whenever possible during vacations. Then in April 1971, when I was studying in Moscow with Rostropovich, Joan came out on a visit, and it was of tremendous pride to me that she not only came to a lesson in the conservatoire, but also accompanied me on the piano for part of the lesson. It was somehow a very special moment, to have both my teachers present. The visit also included quite a bit of sightseeing, journeys to Leningrad and Zagorsk, and being able to act as an interpreter and guide for Joan also gave me an opportunity to reverse our roles, and repay, as it were, some of her guidance. Throughout all my student years, first in York, then in Moscow, Joan’s influence was a wonderful thread of continuity, because I continued to value above all, her critical opinion of my development. She had, after all , set the ball in motion, and she was like a sounding board against which I could measure my success, ( or lack of it! ) in getting to the heart of music. I imagine that many of her pupils felt that, and hope that seeing them gradually find their own direction in life, gave her some satisfaction. I’m particularly happy that the last time Joan heard me ( and incidentally Kitty too, then in her nineties ) was two years ago, playing the Elgar with the LSO. Her presence at the concert was, in itself, special for me. Mind you, I don’t know how on earth I got there without “ getting to grips with technique “ ! Because she set such high standards for her own work, her praise, when she gave it, was truly valuable. As life goes on it seems that we all have to come to terms with the reality of separation; the separation of matter, time and space. But in the mind’s eye, ear and heart, there is no separation, and I do feel that when someone has been as important in your life, as Joan was in mine, one has a sense of it going on being important; the sense of something staying with you vividly, a wonderful gift that cannot be taken away. This evening is proof, if any is needed, that Joan enriched all of our lives many ways.